Hire the best people and allow them to deliver real impact. That’s how you make great things happen. That belief has driven Browning’s 40 years of growth and solidified its reputation as a mid-sized company that outperforms. By embracing that approach, we’ve been able to collaborate with customers and partners on game-changing commercial real estate projects that strengthen communities. To ensure we continue to drive that kind of impact, we’ve made a few changes at Browning … changes that allow our team to put its skills, experiences, expertise and relationships to the greatest use. To reward some of our top performers, we’re promoting them into positions of greater responsibility and impact. In recognition of their work ethic, creativity, integrity, teamwork and project successes (really, we could go on all day …), Browning has promoted John Cohoat and Dale Pfeifer to Vice President of Development, and Terry Hebert to Vice President of Pre-Development. To ensure our organization is structured for the most efficient and effective operation, we have created two new roles: Adam Chavers and Mark Susemichel have been named Chief Development Officers. They each will continue to work on their respective projects, but they also will have primary responsibility for the success of the development team and its individual members. To make sure we have the human resources needed to deliver everything our customers and partners expect when working with Browning, we have recently added four new members to our team. Eric Smith has joined Browning as an Assistant Field Superintendent, Bill Niehaus has signed on as Maintenance Engineer, and Zachary Hanson is a new Project Coordinator. We also have two employees that will be starting within the next month: Tyler Klaehn, Finance Manager; Manager; Boyd Warner, Jr. Estimator. Even as we make these changes, you can count on the things that define Browning to stay the same: We will always work with customers and partners to strengthen communities by developing, building and managing game-changing commercial real estate projects. Count on Browning to deliver big projects, structure complicated deals and exceed expectations. Remember: If you’re ready to move dirt, you can call anyone. If you want to move mountains, call Browning. A member of the LGBTQ community who has deep experience working with transitional housing and homelessness has been named the founding executive director of Trinity Haven, Indiana’s first home for LGBTQ youth who have nowhere safe to live. Jenni White comes to Trinity Haven after serving at Coburn Place Safe Haven since 2010, most recently as vice president of mission impact. Slated to open this summer, Trinity Haven is located in a large Arts and Crafts-style home in Mapleton-Fall Creek. It offers a safe, welcoming transitional home for LGBTQ youth ages 16-21. When it opens, Trinity Haven will be able to serve as many as 10 youth at a time, with the potential to eventually house 15 or more. The need for Trinity Haven is great. Every month, between 40 and 65 young people arrive at Indiana Youth Group (IYG) without a safe place to live. Many of those youth end up sleeping on park benches, in their cars, or under other dangerous conditions. Nearly 70 percent have experienced family rejection based on their sexual orientation and gender identity, according to a 2012 survey by the Williams Institute at UCLA. Trinity Haven is collaborating with IYG, the city’s experts in the needs of LGBTQ youth, which will provide its effective, strengths-based programming at the house and also at IYG’s new headquarters just a few blocks from Trinity Haven. Through its community partnerships, IYG can refer Trinity Haven residents to LGBTQ-friendly organizations such as Goodwill’s Metropolitan High School and Excel Center, Indiana Legal Services, and Adult & Child Health. Trinity Haven is committed to maximizing resources and reducing redundancies in order to increase youths’ chances for success. Volunteers have been working for more than a year to bring the home to reality. Today, $900,000 of the $1.5 million needed to complete Trinity Haven has been raised. Renovations are underway, and the approval process with the Indiana Department of Child Services has begun. Funds to date have come from Lilly Endowment, Impact 100 of Greater Indianapolis, the Faith & Action Project at Christian Theological Seminary, the Mike L. and Sue L. Smith Family Fund, Trinity Episcopal Church, St. Richard’s Episcopal School, St. Paul’s Episcopal Church, the Coalition for Homelessness Intervention and Prevention, and many generous individual donors. Trinity Episcopal Church incubated Trinity Haven until it received its own nonprofit designation in 2018. While all youth will be warmly welcomed at Trinity’s worship services if they wish to attend, there are no religious requirements for residents of Trinity Haven. “Faith-based organizations have a special obligation to mend this particular tear in the social fabric, because the misapplication of religion is a significant reason these youth live in danger,” said the Rev’d Julia E. Whitworth, rector of Trinity Episcopal Church. White is a native of Logansport, Indiana. In addition to roles at Coburn Place, she has worked in various capacities with the Damien Center and Leadership Evansville. She is active with the Indiana Coalition Against Domestic Violence and the Indianapolis Continuum of Care, and she is an actor at the Phoenix Theatre and several community theaters in Indianapolis. She earned a bachelor’s degree from the University of Indianapolis and a master’s degree from the University of Evansville. She and her wife live on the Near Eastside with their teenage son. For more information, visit trinityhavenindy.com. Building on the success of a partnership with the National Park Service that saved four extraordinary homes from Chicago’s 1933 World’s Fair, Indiana Landmarks is offering the famed House of Tomorrow for a 50-year lease to a party that will undertake its restoration. Located in the newly designated Indiana Dunes National Park near Beverly Shores, on the southern tip of Lake Michigan, the House of Tomorrow was widely regarded as one of the most innovative houses in modern architectural design when it debuted at the Fair. After the Fair closed in 1934, it was one of five “Century of Progress” homes moved from Chicago by barge and truck to Beverly Shores, a new resort community developed by Robert Bartlett. The houses were sold and remained in private hands until the land became part of the Indiana Dunes National Lakeshore, a unit of the National Park Service. Homeowners became lessees, with little incentive to maintain the historic homes. In the early 2000s, Indiana Landmarks collaborated with the National Park Service on a new approach. Indiana Landmarks leased the houses from the Park Service, then subleased them to individuals who restored them to specific standards. Four of the five homes have already been restored under the arrangement. The House of Tomorrow’s unusual architecture and degree of deterioration presents greater challenges; it needs nearly $3 million in rehabilitation. Designed by noted Chicago architect George Fred Keck, the House of Tomorrow was a popular attraction at the 1933-34 Century of Progress Exhibition, where more than 1.2 million people paid an extra 10 cents to see inside the house. In the depths of the Great Depression, the World’s Fair drew 39 million people to see how advancements in science and technology could improve life across the globe. Architecturally, the House of Tomorrow was among the first residential buildings to employ a glass curtain-wall structure, predating both Mies van der Rohe’s renowned Farnsworth House and Philip Johnson’s Glass House by many years. It was also among the first buildings in America to use passive solar energy as a sustainable heating technique. The attached garage—also an innovation—used a door that rose at the push of a button. Keck’s design included one element that remains futuristic—an airplane hangar—also with a push-button door—for the small airplane Keck envisioned every family would own in the future. In partnership with the Indiana Dunes National Lakeshore, Indiana Landmarks is accepting proposals for the restoration and long-term lease of the House of Tomorrow for use as a single-family residence. In exchange for restoring the house to the approved specifications, the successful party will receive a 50-year lease on the property. The National Park Service will continue to own the House of Tomorrow throughout the lease. For more information, visit www.indianalandmarks.org/house-of-tomorrow. 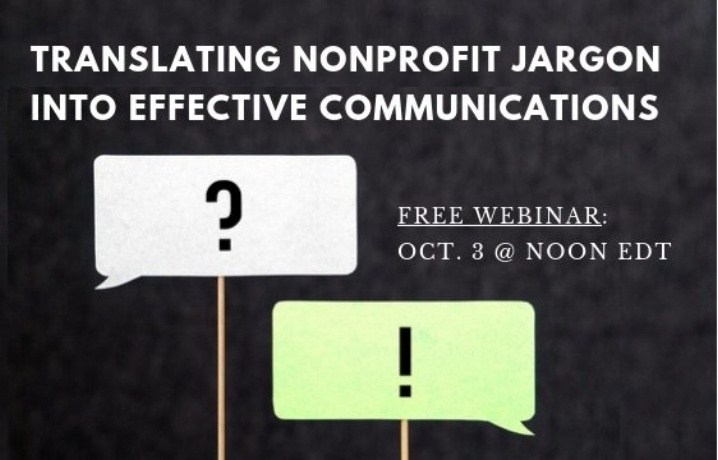 On Oct. 3, John had the opportunity to chat with JGA's Angela White about translating nonprofit jargon. To listen to a replay of the webinar on the JGA site, go to http://www.jgacounsel.com/reso... (Of course, you can also listen to many other great webinars on the same site). We hear a lot about the increasing need for college degrees. We’re told that, because so many of today’s jobs require a college education, young people who want good careers must go to college. Generally, that seems like good advice, but it overlooks two realities: One, our economy relies on high numbers of skilled workers without degrees; and, two, not every young person today wants or needs to go to college. It’s time to change this “everyone should go to college” mindset, along with the attitude that those who do not go to college are limited to low-income jobs (and, by inference, unhappiness). I don’t suggest that this is a challenge we must face for the future. It is a challenge we must face today. Across America, building projects, manufacturing lines and more are lagging because employers can’t find enough skilled workers. Nationally, estimates suggest that more than 243,000 jobs await workers in the construction industry alone. At the same time, we see negative repercussions from our efforts to push everyone into college. For one, record numbers of people drop out. Recent studies show that barely more than half of all students who start college will finish within six years. But the problem isn’t just that these people might have wasted a couple of years or might have suffered unnecessary stress. The problem is that many of those dropouts are leaving school with considerable student loan debt. In 2015 and 2016, 3.9 million students dropped out of school with student debts, with many owing thousands of dollars. In other words, they were worse off than when they started school. Now consider the alternative: If those same people had entered a skilled-trade training program, they would have earned money while they learned a trade. They would not have student debt hanging over their heads, and they could earn as much as many people coming out of college. I am not disparaging the value or benefit of a college degree. However, I am suggesting that, in our effort to ensure that everyone has the opportunity to attend college, we have pushed the pendulum so far that we now suggest that everyone must go to college. By doing that, I think we have pushed into college some people who would be happier—and better off—if they learned a skill and entered the workforce. How do we overcome this problem? For one, we acknowledge that college should be open for everyone but isn’t the answer for everyone. Second, we should embrace the value and benefit of skilled trades. 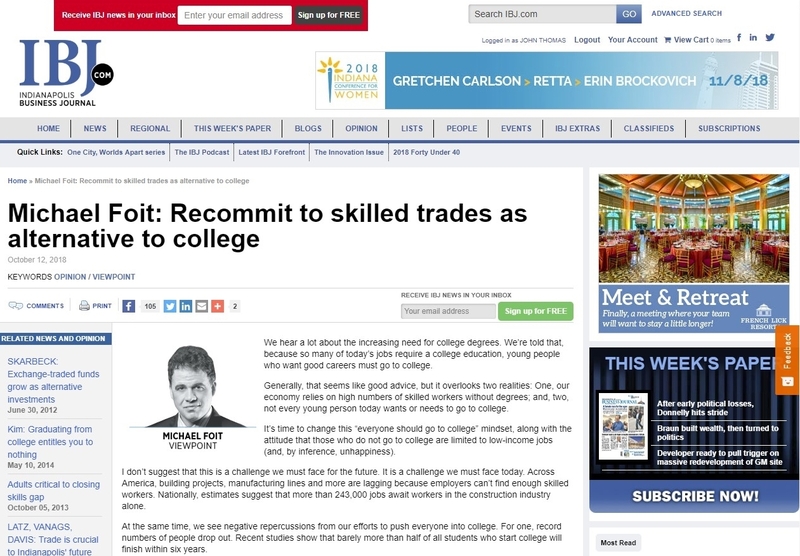 Employers who rely on skilled trades should collaborate to make their case to the parents, counselors, educators and others who guide young people to let them know that there is an alternative to college—an alternative that, for the right people, leads to happiness, financial security and long-term fulfillment. Browning’s plans for additional construction include: Renovation of office and high-bay garage once occupied by Citizens Energy Group; anew Class A office building including food, beverage and retail space; and a new multi-family apartment complex with approximately 250 units. As you consider that statement, note what I didn’t say: I didn’t say these lost organizations didn’t sendmessages. They probably sent a lot of messages. But they didn’t send them effectively. John Thomas is co-owner of JTPR Inc., an Indianapolis-based public relations firm that works with nonprofit and for-profit organizations to deliver messages that move people to action. Sometimes marketing types talk about brands and identity like they’re talking about alchemy. Or top-secret missile codes. Or Col. Sanders’ seven herbs and spices. We tend to think of it more plainly than that. A brand should simply be a reflection of an organization or product. And as that organization or product evolves, that brand and the way it is communicated – through a graphic identity, a tagline or whatever – should evolve, too. That’s why you’re seeing a new logo for JTPR. We’ve evolved, and it’s time for the way we present ourselves to evolve, too. Of course, we started out as Jen Thomas PR, a one-woman show that quite simply got the job done. We grew into JTPR, a two-JT firm that offered solid, clear-cut skills and expertise. And now we think of ourselves a little differently. We still offer those same services, but we put an increasing emphasis on the power of the well-chosen word, straightforward counsel and the right action at the right time. It’s what our clients say they expect from us … what we do best. So now we describe ourselves like this: JTPR gets people talking about things worth talking about in order to move people to action. With expert counsel, the right words and hands-on execution, we help organizations reach the right audiences, say the right things and get the results they want. When we discussed this vision of our business with our friend (and designer extraordinaire) Lindsey Hadley, she brought back a new logo for JTPR that we think captures wonderfully who we aspire to be: It’s sturdy and solid, with a dash of color and whimsy. It gets the job done with a bit of flair and fun. That might not be as impressive as alchemy, or as intriguing as missile codes, or as “spicy” as a secret chicken recipe. But it’s who we are. During our firm’s recent rebrand, we spent a lot of time pondering the right words to describe what we do best. We settled on Advisors. Writers. Doers. Since the core of our work involves writing, Writers was a no-brainer. Advisors was pretty easy, too. At this stage of our careers, we’re confident in our recommendations and the advice we provide clients. The last word, though, was harder. We ended up with Doers. We hesitated about that at first, worried that it sounded too tactical, too elementary, too lightweight. “Doers” are often seen as the “lowest rung” on the ladder, and we didn’t want people to think of us as a “low-rung” organization. On the other hand, one of the reasons we opened our shop is that we wanted to provide advice to our clients and then actually see it through to fruition. To DO the work. We like what we do, and we plan to stay small – just the two of us – so we are, by design, the doers. Of course, we also believe that serves our clients well. When they choose us, they get veterans doing the work. We’re not cooking up big ideas and handing them off to junior staffers. We’re not promising expertise and delivering rookie execution. We’re following through. Putting our experience to work. Making sure the job gets done. And when we do need help? We reach out to the best partners and subcontractors in the business – people who we know value good work as much as we do – and continue to be engaged so that the job is done right. Yep: We’re doers. And we feel good about that. We’d love to help you reach the right audiences, say the right things and get the results you want.